Brendan the Navigator or Brénainn moccu Alti as he is often known in the medieval Irish tradition is the patron Saint of two Irish Dioceses, Kerry and Clonfert. This reflects the two main spheres of his land-based life. The waters around Ireland and Britain and, as tradition would also have it, the vast ocean to the West provide the focus for the sea-based material in the medieval tradition. Brendan occupies a special niche in the history and tradition of the medieval Irish church. He is one of the “Twelve Apostles of Ireland”,one of those said to have been tutored by the great teacher, Finnian of Clonard.e is also one of the great monastic founders of the early medieval church with foundations in Kerry, Galway, Clare, Mayo, Scotland and Wales attributed to him. Two of these monasteries, Clonfert and Ardfert (although Ardfert may have been an earlier foundation) went on to have a very significant role in later ecclesiastical history and gave their names to Dioceses as these were formally established from the twelfth century on. he is also credited with having founded the monastery of Eanach Dúin or Annaghdown on Lough Corrib which originally had a community of women under the leadership of Brénainn’s sister Bríg but which later on seems to have had both male and female religious. The Annals of Inisfallen date the birth of Brendan to 486AD and his death to 570AD. The Lives tell us that he died at Annaghdown but was brought, as he had instructed, to Clonfert for burial. These Lives of Brénainn, of which five different versions in Latin and two in Irish survive, tell us of his birth and upbringing, of miracles of healing, patronage and wisdom, of voyaging and different foundations. Brénainn was born among the Altraige, a tribe originally centred around Tralee Bay, to parents called Finnlug and Cara. Tradition has it that he was born in the Kilfenora/Fenit area on the North side of the bay. He was originally to be called Mobhí but signs and portents attending his birth and baptism by Bishop Erc led him to be baptised ‘Broen-finn’ or ‘fair-drop’. He was fostered by Naomh Íde, who has the title of being the foster-mother of the Saints of Ireland. In later times it seems that the Ciarraige, who came to dominate the region, adopted Brénainn as their patron and carried his cult with them as they expanded. 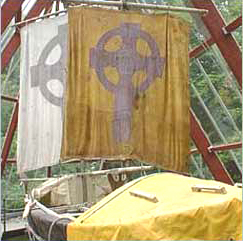 The young Brénainn was tutored by Erc and travelled in his youth far and near to learn the Rules of the Saints of Ireland. It has also been suggested that he travelled as far as David of wales to learn his Rule from him. In the Lives, Brénainn has a vision, from a high mountain, of a secret place far out in the ocean, a place where he will be able to find God in a deeper way. This mountain seems to be Mount Brandon in the tradition,one of the three great pilgrimage mountains of the West coast of Ireland (Croagh Patrick and Slieve League being the others) although the cult of Brénainn was probably only brought there as the Ciarraige expanded West. The desire to find this place led Brénainn to undertake a series of voyages. Brénainn’s association with these voyages and the development of a genre of voyage-tales in the tradition led to an association between Brénainn and voyaging which has lasted to this day. This association reaches its high-point in the Navigatio Sancti Brendani, The “Voyage of St. Brendan”, a text which was to become one of the chief contributions of Ireland to the literature of medieval Europe. This text was translated into many different languages and most main medieval libraries seem to have had a copy. This text was to become the great epic of the sea throughout Europe.The text is richly crafted and has been seen by some as presenting the ideal of the monastic life and a celebration of the Liturgical Calendar.